The archipelago of San Andrés and Providencia forms the Caribbean chain of islands of the Insular region some 480 miles (720 kms) off the Colombia coast. These islands have an exceptional variety of flora and fauna, so diverse that UNESCO has identified it as a World Biosphere Reserve. These pristine islands offer magnificent diving in the clear waters that wash on the soft white sands of the numerous beaches on both main islands. Though only 56 miles (90 kms) between the two islands, the contrast is noticeable with San Andrés offering a tax haven with Duty Free shopping, top class facilities and stretches of beaches catering for Colombians and foreigners alike. In contrast Providencia is less populated, mountainous, no vehicles and designated a national park. However, both islands present their own attractions for visitors to discover but also share crystal clear waters and favourable climate all year round. 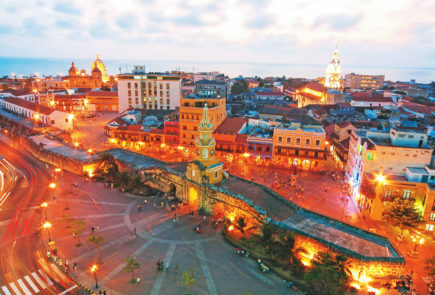 The two largest islands of the archipelago on the Caribbean Sea, San Andrés and Providencia are often overlooked by foreign travellers as a destination of Colombia due to its proximity. However, the islands offer stretches of white sandy beaches, year round sunny climate, fascinating eco-tourism and Duty Free.